Goldfish Were Originally What Color? The World's Largest Wayfinding "You Are Here" Map Is Located In? Modern goldfish, staples of aquariums and ornamental ponds across the world, are the descendants of small carp domesticated in ancient China thousands of years ago. The original fish were a silver color with the occasional mutation yielding a more colorful variation in red, orange, or yellow. The first such mutations were recorded during the Jin Dynasty over fifteen centuries ago. 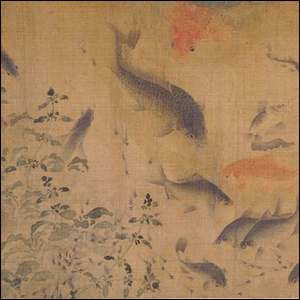 It wasn’t until the Tang Dynasty, around 618 – 907, however, that the keeping of carp in ornamental ponds became popular. It was also around this time that people began isolating the fish with unique gold coloration to further breed them in hopes of producing more distinct coloration. Even with the initial interest in the Tang Dynasty, there weren’t many truly golden fish; it wasn’t until the Song Dynasty in the 12th century that the goldfish really came into its own. Starting in 1162, the empress of the Song Dynasty ordered the construction of an enormous pond specifically for the purpose of breeding red and gold variants. From there, the practice of breeding and keeping goldfish became enmeshed and by the 17th century goldfish had even spread to Europe.